Over at Pennsylvania HSR, Samuel Walker reminds us that the dominance of coal for US freight traffic slows down passenger trains, and this has a social cost in addition to the direct costs of coal mining and burning. But another post of his, regarding cant deficiency, suggests more problems coming from mixing modern passenger trains with very heavy freight. Coal trains slow all other traffic in three different ways, of which just one is the conventional schedule conflict, and even that means more than just slowing down intercity trains. Schedule conflict reduces not just speed, but also span and punctuality. The Northstar Line in Minnesota shares track with BNSF’s Northern Transcon; since the line is freight-primary, there’s no room for off-peak service, and passenger trains can’t extend to the line’s natural terminus in St. Cloud, not without constructing additional tracks. Similarly, in Houston, plans for a commuter line to Galveston included peak-only service from the start. Second, independently of scheduling, slow trains force faster trains to slow down by limiting the amount of superelevation that can be used. As a reminder: on curves, they bank the track, with the outer rail above the inner rail, to partly counter centrifugal force. If they do not cant the train enough, there’s cant deficiency; if they cant too much, there’s cant excess. Although there are strict limits for cant excess (in Sweden, 100 mm, or 70 on tighter curves), stricter than for cant deficiency (150 mm for a non-tilting passenger train, give or take), technically commuter trains could safely run at higher cant excess; however, for freight trains, high cant excess is unsafe because loads could shift, and the higher axle load means trains would chew up the inner track. Very heavy trains first require the track to have a lower minimum speed, and second have an even more limited cant excess because of the damage they’d cause to the track (about 2″, or 50 mm, in US practice). Walker links to a US standard guideline that uniformly assumes 3″ cant; greenfield high-speed lines go up to 180-200 mm. And third, heavy freight trains damage tracks regardless. Coal trains also limit the amount of revenue the railroad gets out of each train, leaving limited money for maintenance, and are not time-sensitive, giving railroads no reason to perform adequate maintenance. To compensate, industry practices have to be less than perfect: cant and cant deficiency are less than the maximum permitted by right-of-way geometry and minimum speed, and freight railroads require barriers between their track and passenger track to protect from inevitable freight derailments. Even then the US safety level is well below what’s achieved anywhere else in the world with trustworthy statistics. Of course, coal provides a great boon to the freight railroads. It’s a captive market. The railroads could price out coal and focus on higher-value intermodal traffic. Some of the lines that already focus on intermodal traffic are friendlier to passenger service, such as the FEC. The political issue at hand, besides the easy to explain but hard to implement matter of avoiding catastrophic climate change, is what freight railroads are used to. Their entire business model is geared toward relatively low-value goods. A steep carbon tax is a risk: it should raise their mode share of total value of goods transported, which is currently 4% (see also figure 4.3 here), but it would come from a new set of goods, with requirements and challenges different from those of the current mix. The railroads would have to reintroduce fast freight, which most haven’t run in decades, and refine it to deal with the needs of shippers today. It’s not only a headache for the managers, but also a substantial risk of failure – perhaps rival railroads would be able to get all the traffic because they’d adapt to the new market faster, perhaps shippers would change their factory placement to move goods over shorter distances, perhaps they would not be able to cope with the immediate increase in fuel costs, etc. Because of this, freight railroads may end up fighting a policy that would most likely benefit them. Although they represent a critical part of an emission reduction strategy, and are all too happy to point out that they consume much less fuel than trucks, fuel is a major cost to them, and coal is big business for them. These are not tech startups; these are conservative businesses that go back to the 19th century. Heavy coal trains then add a political cost as well: they help turn an industry that could be a major supporter of climate change legislation neutral or hostile to the idea. The end of coal? What’s going to replace it as an energy source? Oil and hydro are already maxed out, wind is inconsistent, solar kills tortoises, and nuclear turns us all into Godzilla. Coal is about the only energy source left, so its role will inevitably increase, not decrease. Most of U.S. fossil energy usage is a waste easily replaceable by savings (building insulation) and move to local energy sources – like switch of A/C units to solar power (that would also prevent many hot-spell-triggered blackouts btw.). Simple energy tax with gradual kick-in is the most natural way to motivate such changes. When such tax is set to fixed amount per unit, it has a nice side effect that it flattens price shocks – for example, gas tax used extensively throughout Europe dampened the 2008 oil shock to aroud 40 % price rise, still non-negligible but much less disturbing than three-fold or bigger shock in USA. I know. Nuclear is by far the best option scientifically but, I fear, impossible politically. “Impossible?” The USA is the world’s largest producer of nuclear power! Try building a new nuclear plant these days in a Western country. Countries like Japan and Germany are moving in the opposite direction, eliminating the nuclear plants that already exist. Japan and Germany have very good reason to dismantle the radioactive, toxic rustbuckets which they have, which are also poised to explode like Fukishima recently did. Turns out nuclear reactors don’t last that long. Not surprising since they’re operating in a very corrosive environment, with high heat, radiation, water, and all manner of chemicals. You have to build a brand new one every 50 years and tear down the old one. France was willing to spend the vast amounts of money to do this, but few other countries were willing to. Actually, solar is by far the best option scientifically. Nuclear? Fukushima. Chernobyl. Poisoned farmland for generations. Forget it. Solar suffers from *economic* problems due to the fact that the various toxic forms of energy production remain legal. There’s an ample supply of sun and solar would be quite capable of supplying the entire energy needs (and wants) of the world. There’s a minor problem of energy storage at night, but the battery problem is being solved, and there’s always pumped-storage hydro. Even if wind and solar aren’t prepared to carry the grid, you’ve neglected natural gas, which, though far from ideal, is cleaner than coal and has been increasing for a decade as a proportion of US power capacity. Natural gas may be cleaner in a conventional pollution emissions sense, but where harvested by hydrofracturing, its not clear that it has lower GHG emissions impact over the first two decades, because of the problem of fugitive methane emissions. Rooftop solar is extremely low-environmental impact. It’s also friendly to traditional (pre-HOA) suburbs and low-rise city neighborhoods, because the houses are invariably big enough to generate all electricity they need locally, and individual home ownership means that the person who would pay for the panels is the same person who currently pays for electricity. It’s possible to do the same in urban apartment buildings, but harder because electricity consumption per square meter of dirt is higher. Of course the current relative costs of coal burning and solar panels make this cost-ineffective. But if the government makes an effort to price emissions appropriately, and subsidizes rooftop panels or at least makes it easy for homeowners to pay market rate, it can happen. The problem is purely political: both the costs and the benefits are diffuse; PV cell manufacturers would get a big chunk of the benefits, but much of the cost of installation is local construction workers (i.e. people who were laid off when the housing bubble burst and need the work). The reason the US is neglecting rooftop solar in favor of large-scale solar is that the benefits of the latter are concentrated in a few companies whose business is solar power and that can lobby environmental organizations and politicians to support their goals. PV cell manufacturers aren’t “a few companies whose business is solar power”? Smaller business than running power plants and selling power to customers, presumably. If rooftop panels are at least 143% more expensive than large-scale installations, don’t you think that’s a big reason why investment is primarily in the latter? But investment is not primarily in the latter. It’s only primarily in the latter in the US, a country with a marginal solar industry. Surely investment in the former is artificially increased by the subsidies that are given to it more than to the latter? There are cases when inadequate subsidies caused of large-scale solar installations on prime agricultural land. The problem with rooftop solar is not the cost of panels, but the fact that installation costs have remained high. Not enough of the auxilliary equipment is mass-produced off-the-shelf. The prices of brackets alone are startling. The costs of installation of solar panels on simple angled stands which sit on a large flat roof (like most ‘big box’ stores) or on the ground are getting quite cheap. There’s still a weatherproofing issue which is not straightforward to solve there, though. However, rooftop installations remove load from the main grid and with most areas having a dominant summer peak, remove load when the marginal cost of power is at its highest. The grid has to connect to the houses anyway, and the houses are occupying the land anyway, so the opportunity cost of the space taken and grid infrastructure support is lower than most utility scale solar farms. one side point: less economies of scale also mean more people are hired in the process. Small business is less efficient, but gets a job to more people. However, the volatility of wind drops as scale increases ~ a wind farm is less volatile than a single wind turbine in that farm, multiple wind farms in the same wind resource are less volatile than a single wind farm, and multiple wind farms from multiple resources are less volatile than multiple wind farms from a single wind resource. Adding additional volatile sources of power such as solar and run of river hydro to the portfolio reduces the total volatility of the portfolio further. Firming capacity is required to allow a large share of total wind power to act as baseload, but while that requires substantial capacity, it does not require a substantial percentage of total energy supply, so existing hydro capacity, pumped hydro, and biocoal are all viable sources of firming capacity. Volatile sources need to be augmented by appropriate energy storage and beefy enough lines from source to the storage, period. Specifically Germany causes near blackout every autumn in recent years because installed wind power in North Sear rises, it’s mandatory for network to accept energy from renewables anytime and storage is located mainly in German and Austrian Alps. Germans hate new high-tension power lines equally as nuclear plants. The result is that when winds start blowing in October – November, they’re strong enough to saturate germant power lines and excess power spills to adjacent countries en route to the Alps. Guess what happens when their capacity is reached, too? As noted, the volatility of a single wind resource is greater than the volatility of multiple wind resources. Of COURSE we need to put long haul UHVDC intergrid transmission capacity, but we will need to put in long hail UHVDC transmission capacity in any event, so that is neutral with respect to renewable energy versus various promising potential nuclear fuel cycles. Our lack of expansion of long haul inter-grid transmission capacity over the past twenty years is a policy failure, not a technological limitation. Much analysis makes the mistake of treating storage as a source by source problem, when as a grid-level problem it is in many cases a matter of redistributing existing dammed hydro capacity. Yes, there’s a fairly short example of a UHVDC transmission corridor. I kind of wonder if the whole approach to power grid control is fundamentally wrong. The idea now is that there is a set of consumers, who demand some amount of instantaneous power, and a grid connecting them to producers, who need to meet that demand exactly by adjusting their output. With things like wind and solar (and even nuclear, but for different reasons), there are inherent problems with being able to adjust output quickly. So why not try to control the demand instead? We finally have the technology to be able to do that, and contracts for power can specify priority, with guaranteed power being expensive, and idle-priority power being cheaper. I’m sure there are arrangements like that among internet providers that can be used as a model. Yes, you’re describing the smart grid concept. That’s another part of the mix. Another way in which the need for storage is overblown is that a substantial amount of the volatility in volatile power sources is predictable in advance, so that following load from other sources can be scheduled. That is where biomass as biocoal can play an important role. Taking the expected yield from wind turbine harvest capacity as the actual wind power energy supply, 30% of that power will be available 95% of the time, so that with 1.5% of that total power supply available as firming capacity, 30% of the total wind turbine harvest capacity can be treated as baseload power (of course, the baseload capacity increases with adding other volatile energy sources to the mix ~ especially solar, since wind and solar availability tends to be inversely correlated). That firming capacity requires that total baseload capacity, but it can be delivered from an energy supply that has a much smaller total energy supply available than wind power, such as biocoal, or reverse pumped hydro storage. The two together make for better quality firming capacity than either separately, with thermal biocoal plants able to be fired up when there is an expected shortfall, and rather than spinning reserve, the biocoal power feeds pumped reverse hydro storage when demand is below volatile plus biocoal supply, and then that power is drawn out of the pumped reverse hydro when demand is above volatile plus biocoal supply. The concept that anybody can place any demand at any time and have it met immediately will be seen as another of those “what on earth could they possibly have been thinking?” by the people who will have to live with the consequences. There is a basic, fundamental, practical difference: you can use less bandwidth or just slow down your data flow. However, for most electrical applications, you can’t use them under-powered. Apply more load than supplied, and you get an outage. Richard: in the early 20th century, when these systems were being designed, they didn’t exactly have the technology to deal with these sorts of control problems. This sort of thing relies on near-instantaneous reaction and a fairly large scale of coordination, something that’s just not possible with 1920s technology, so they figured it was easier to just control the problem at the source, as it were. Andre: there are plenty of network applications that have pretty strict demands on both bandwidth and latency. And for “half power”, it depends on the scale at which you’re looking at the problem. Sure, your aluminum-smelting furnace needs full power to run usefully, but you could just turn off half the furnaces in a smelting plant during periods of peak demand. At a local scale, either a device is on, or it isn’t, either the packet gets through or it doesn’t. But at a network scale, these flows are much more malleable. @Andre Lot: Its not either/or. With specific investments in long haul transmission, the US already has sufficient dispatchable power supply to move to 20% windpower in our electricity supply without requiring substantial new power storage. Increasing the solar power share increases that threshold, because of the greater stability of a wind/solar mix compared to either alone. Including consumption responsiveness from a smart grid system as part of the mix pushes that threshold up further. Adding run of river hydro and pumped hydro to existing hydro capacity and modular pumped hydro pushes that threshold up further. Smart grids and supply-responsive power consumers are a quite useful part of the portfolio, but the primary advantage of a strategy of exclusive reliance on smart grids is that it is a simpler and more dramatic position to adopt in internet forums. And we are flaring off natural gas now in natural gas fracking wells that are primarily harvesting natural gas liquids ~ electricity superhighways can help convert that stranded natural gas to electricity, and if it increases its commercial value increases the incentives to the fracking drillers to capture the fugitive methane emissions that presently make fracking natural gas about as bad a GHG emitter as coal. Even if a Random Omnipotent Being popped by and got rid of all the coal power in the US today, there would still be a heavy degree of coal traffic on the rails, largely on the same rails. We export a lot of coal, and higher exports are expected as China continues to ramp up their coal consumption and imports; India and Japan will be doing so as well (since Japan has decided that they’d rather pollute hellaciously than use nuclear in the wake of Fukushima). That’ll be the real impact of the Panama canals widening, in my opinion; coal ships from the East Coast or Gulf to Asia. Good point. Most of the coal CP moves is low-sulpher coal destined for Chinese iron smelters. Metallurgical coal is a small fraction of coal traffic. Less than 10% last I checked. If it was so much of a bother to carry heavy freight the railroads wouldn’t be busy upgrading lines to 286k and 315K. Some of the lines that already focus on intermodal traffic are friendlier to passenger service, such as the FEC. Florida is flat. Doesn’t matter too much what FEC is hauling around – btw lots of it is limestone heading to cement plants or cement – because the FEC was built as part of a real estate scheme in the 1890s. They built lots and lots of nice straight track. Straight track doesn’t need superelevation. The coal trains that would stop running would be replaced by trains carrying higher-value goods. Or replaced by high voltage lines. It’s already happening, it’s cheaper to generate the electricity in the coal fields and ship the electricity than it is to ship the coal and generate the electricity near the loads. Then there’s all the “hot” intermodals running around. UPS doesn’t put stuff on trains unless it’s going to get there on time. How much of a bother it is to upgrade lines to 310,000-pound cars depends on what mix of goods the railroad expects to carry. If it’s expecting to compete with trucks for same-day shipments, then it’s a huge headache, because the high axle load requires much heavier maintenance if the trains are expected to maintain a minimum speed and the following trains are expected to not derail. If it’s expecting to carry predominantly low-value, time-insensitive goods (with some exceptions, though the FEC is special in that it already has PTC), then raising axle loads cuts the cost of infrastructure for passing loops and such, but doesn’t increase maintenance costs that much because the trains are going slowly. The other railroads have similar maps. So do some state DOTs. Alon, european 15-17 t/axle HS train at 250+ km/h has about the same track load as 22.5 t/axle freight running at ~100 km/h. The same will apply in USA for slow heavy freight vs. fast lighter – track upgrades will mean that heavy freight may be even heavier and fast freight may be faster. The issue is that the maximum axle load in the US is not 22.5 t, but 35.7 t. Railroader experience on the NEC, such as it is, is that 200 km/h Amtrak trains do not cause damage to the track, but a single fully laden freight train does and the next passenger train after it will feel the difference. The design envelope for the Australian Inland Rail Expressway was to be 21t for 115km/h fast freight and 25t for 80km/h heavy freight, or IOW 23ton axle load for 70mph fast freight and 27.5ton axle load for 50mph medium freight. That’s in line with what I say. Given that jacobs bogies of articulated well cars of fast freights can reach 30 t/axle, 35 t/axle for slow freights looks reasonable. The question with the 40ton axle load freight is what is the maintenance cost to keep it as Class 5 track if you are running loads on it that are near the physical limits of steel rail, hence the special conditions noted in adirondacker’s CSX chart. The 35.75ton, or ~33t, is the general mainline heavy freight. Compared to that, 27.5ton (25t) axle load and 23ton (21t) implies distinct new freight classes, which raise all of the commercial risks that Alon notes in the post. One of those risks is the risk that you build to a design envelope, a competitor builds to a slightly different design class which for one or another reason becomes the default ~ and you pay a first mover penalty as you have to modify to suit what has become the default envelope for the new freight classes. One nitpick: the general mainline heavy freight standard in the US is 315,000 lbs., i.e. 35.7 t.
The design envelope is not that big of a problem, because the US already has standardized loading gauges and such. The need for a new class of what light freight means in terms of track maintenance is an issue, but even that’s not as problematic – there are standards for passenger trains, and then the main question becomes what axle load allows trains to not derail without raising maintenance costs through the roof. The axle load of a locomotive, i.e. about 22.5t, is probably going to end up the default. I still think these questions are far smaller deals than the need to actually maintain those tracks to specified standards. I mean, look at PTC: there is something like a national standard, developed by the Class Is, and they’re still trying to get out of it. Where for the most part 143X freight is limited to single car movements, which is to say a car separated from the locomotive and from other 143X cars by one or more 286,000 lb or less cars, and the coverage of 286 freight is substantially greater than the coverage of 315 freight. Speaking of “hot” intermodals, I’ve noticed that the Empire Corridor doesn’t seem to carry bulk goods, through Syracuse, anyway. There’s lots of intermodals and lots of empty stock movements, the occasional train of autoracks or boxcars (and what do you call those slatted-side cars which look like the sides open garage-door-opener style? ), and sometimes a steel train, all going at cruising speed of 79 mph. I think all the coal got shifted to the Southern Tier route or the Class IIs. What are best practices in other countries where unit coal trains are mixed with fast passenger trains? In particular, I’m thinking of China and Russia, as well as France, Germany, Poland, and the UK (aren’t Wales and the Ruhr Valley still coal-producing regions? ), and possibly even Australia. Wales isn’t really a major coal producer any more. However, the railways in Britain still move a lot of imported coal from ports to power stations. (Those power stations were built near now-inactive coal fields). Fully laden coal trains are normally classed at 60mph, and the emtpies at 75 mph. 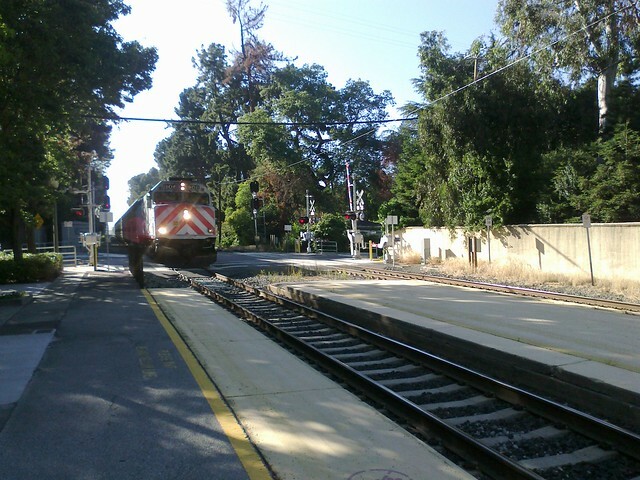 The passenger trains on those tracks are often running at 100mph. I get the impression that modern freight wagons in Britain are kinder on the tracks than their US couterparts. That may because tracks and trains are owned by different companies, and deomstarting your wagons cause less wear on tracks will get you lower access charges. The other big difference is that British freight companies compete primarily on speed (apart from captive traffic like coal), while US freight companies compete primarily on cost. I have one question, though: deomstarting? In the original Scott Walker post Alon is building this one on, he suggests electrifying the Pittsburgh-Harrisburg (former PRR Broad Way etc.) mainline. This makes me more keen to understand the economics of hauling unit coal trains under wire, as I’m almost certain is done in China, Russia, and continental Europe. A historic coal-under-wire operation in the U.S. was the Virginian Rwy., acquired by NS progenitor Norfolk & Western in 1955 and subsequently dewired (the N&W favored extremely heavy true Mallet Y6bs for their run, and both they and archrival Chesapeake & Ohio–progenitor to today’s CSX–were among the last major U.S. railroads to dieselize), which suggests that there is positive economics in hauling coal under wire. I suppose the question I’m wondering about is whether electrics yield more horsepower (and hence speed) per unit BTU over diesel equivalents? By the way, Alon, new four-axle road freight diesels have not been produced in the U.S. for some time, even though there is definitely a submarket for them, particularly in the Class II regional sector (e.g. the P&W, Pan Am, R&N, and W&LE), resulting in these railroads having to make do with aging (and decreasingly reliable) units none younger than a GP60 (ca. 1990). At the same time Europe is producing models of exactly that kind of unit like crazy. What do you think the consequences of this will be going forward–especially as more-affluent Class II roads needing or preferring four-axle power start looking to buy new and not continue to work their way through the (not-inconsiderable) existing four-axle stock left over from the days when there were still more U.S. Class Is than you could count on your hands? Electric locomotives yield more power for freight hauling than diesel-electrics, both because they are not hauling the weight of the diesel electric generators, and because the wire can deliver more power than the diesels can. The power doesn’t have to come from diesel. As one coal train is going down the mountain using it’s regenerative brakes another one can be going up the mountain using the regenerated electricity. “they are not hauling the weight of the diesel electric generators” would be referring to the source of electric power on the diesel-electrics, not to the source of electric power for electric locomotives. Freight is generally adhesion limited. Freight locomotives for heavy freight are chock full of heavy ballast. Hauling around a big cylinder block is no disadvantage. I don’t get the railfan obsession with wiring up the US freight network. Diesel locomotives are a very mature and cost-effective and efficient and comparatively energy efficient technology. There are hundreds of lower hanging fruit in the national/global emissions priorities, not the least of which being to get more freight moving behind more diesel locomotives. Yeah, sure clean up the particulates, and don’t idle the damned things for days at a time, but try to have some basic order of magnitude realism about the real problems and the effectiveness of putative solutions. Funny you should mention getting moe people on buses versus reducing buses’ emissions… I recently worked on a project wher I had to make precisely that point: that the best way to reduce city-wide emissions would be to increase transit mode share, not spend money on hybrid buses. Not just increase mode share, but also increase ridership on off-peak and especially reverse-peak buses. The issue is that small cities have very low bus occupancy sometimes, and then the emissions advantage of transit over cars is reduced. (The average US bus at average US occupancy gets about 36 passenger-miles per gallon of diesel; you can beat that in a car per passenger-mile, though obviously in a car you’d go much longer distances and the bus would win again.) Getting more people on buses in the off hours and especially when the bus goes empty in the reverse-peak direction is the best way to get people out of cars and on buses and also to increase bus occupancy. @Tom West: the time when there is a compelling private commercial interest to electrify on the basis of funds raised in private capital markets will be substantially after the time when there is a compelling public interest to electrify on the basis of public interest subsidies and capital refunded by user and access fees, since there are substantial third party benefits that cannot be tapped by the freight railways to repay the capital cost, and since freight railways are already capital intensive businesses that must pay a risk premium for financial capital, because of the risks of being unable to service the debt from electrification in the face of an economic downturn. @RM: I wouldn’t know what the interest of railfans would be, but the interest from the side of sustainable transport is the opportunity to haul freight over long distances at higher energy efficiency than diesel rail and even greater energy efficiency gains over long haul trucking without requiring petroleum. The problem with trying to make freight rail more energy-efficient is the mpg vs. gallons-per-mile problem. If you have one mode that gets 450 ton-mpg and one that gets 90, you’re going to get very little extra benefit from raising the efficiency of the first mode to the equivalent of 1,200 ton-mpg, and more from raising the second mode to 150, and even more from shifting loads from the second mode to the first mode. Yes, the majority of the gains in the Millennium Institute modeling are from the transfer of long haul freight from truck to rail. Achieving that transfer is the point of David Drake’s proposal. Alon, when you can make freight rail more energy efficient *while* making it faster, so that it is more attractive to customers and can run more volume over the same amount of track… then it starts sounding wise. The energy efficiency is in this case just a bonus. As said before, BNSF has a tipping-point price for diesel at which it becomes an economically wise decision to electrify their whole network. That’s all they announced about the expensive study they did on electrification; they didn’t annouce what the magic price was. Obviously, the speed gain is something more useful. Though, for a given level of investment, I’m honestly not sure the freight railroads would want to put it into the speed gain of electrification. Probably they’d want to spend money on better track maintenance to prevent derailments and reduce slow orders. Maybe also put more money into better last-mile connections. The Super C did LA-Chicago in 40 hours, vs. 32 hours by highway; what’s achievable with present technology is already good enough on the main lines. “… and demostrating your wagons cause less wear on tracks will get you lower access charges.” (I.e., you can measure the wear from your wagons and point out they cause less wear than anotehr wagon, and hence get lower access charges from the track owner). In Australia, in the main run in the Lower Hunter Valley down into the coal loaders in Newcastle (last I checked, the largest coal export port in the world), the coal lines are primarily dedicated and the Main North carries commuter and regional passenger rail and the long distance freights Sydney/Brisbane and Melbourne/Brisbane. However, when traveling to NSW’s Northern Tablelands, after the Hunter Valley line splits off from the Main North to New England, it seems that the regional passenger rail is running on the coal lines and although the DMU Countrylink Xplorers are capable of 130km/hr, it seemed as if slow orders were common through the Upper Hunter valley until the Murrurundi tunnel to leave the Hunter Valley and cross the Great Divide into the outback. My thoughts on this subject tend to circle around using alternate routes for super-heavy shipments, potentially restoring or building new (relatively) short segments of track to get them out of the way of passenger trains. In the case of formerly double-tracked lines, the second track could be restored. Unfortunately, BNSF and UP prefer to have multi-tracked lines with huge spacing in between tracks these days, so “restoring” a track might require building a whole new railbed. But still, one track could have greater banking on curves and be the preferred track for passenger services (with heavyweight trains disallowed), while the other (or one of the others) would be dedicated to slow, heavy trains with high axle loads, but could also accept passenger trains operating at reduced speed. In the case of Northstar, I would think that many (though not all) coal shipments could be shifted to run on the BNSF line through Willmar (the historic routing of the Empire Builder prior to 1979, if memory serves). Alternately, there was historically another rail line parallel to Interstate 94 which still exists as far north as Monticello. It would be nice if that could somehow be restored, though there are now buildings in the old ROW and constructing another connection elsewhere might require a new crossing of the Mississippi River — it’d probably be more expensive than the current plans to add/restore track along the present Northstar route. Other than that, the only thing I can really think of (short of actually getting rid of coal usage) would be to set up transloading facilities to take large, heavy shipments and shift them to smaller gondola cars with lower weight that wouldn’t cause as much damage to track. The problem is: which track routes that have a viable alternative have enough passenger rail potential to justify both the loss of income from the railroad that bans heavy bulky cargo and the costs to upgrade its tracks? Rather, which track routes that have a viable alternative have enough combined passenger rail and fast freight potential to justify the express track? Track that is balanced for 60mph freight supports higher speed through curves for passenger rail with allowed passenger rail cant excess, though how much higher depends on the curve radius. For a specific example, the old Rock Island Line between western Illinois and Omaha through the Quad Cities, Iowa City and Des Moines, which is presently a single track line line of the Iowa Interstate Railway on the western side, with CSX ownership and IIR trackage rights on the eastern side. The projected passenger capacity requirement is 50% two track and 10% triple track. Dual tracking the balance, leaving the passenger traffic on the through express track, and passing or crossing fast freight on what were formerly the single track sections upgraded for the intercity passenger service would yield substantial medium express freight capacity while retaining the existing 50mph freight capacity. The problem is that having an express medium freight corridor from Omaha to Chicago is no appreciable market benefit on its own. On the other hand, if there was a federal program to provide electrified rapid freight rail paths, that project could well be one component of that federal program. A point made in the recent alignment alternatives for the Chicago to Omaha route is that railways wanted much wider separation triple tracking, to provide road access to both main freight track, while the track separation required on the single track Iowa Interstate Railways corridor (the old Rock Island Line) was much less, and so adding 50% double tracking to that corridor would require less earthwork than the triple tracking. It was also claimed that the geometry for crossing spur lines across the passenger track side was better with the narrower track spacing. CSX, NS, and CN — and probably CP — are just as bad as UP and BNSF about wanting to waste valuable track space as empty “maintenance access”. Worse than BNSF, actually. The exception are places where they’re tenants. So for instance NS wants wasteful empty space from Harrisburg to Pittsburgh in PA (where they own the railroad) but doesn’t ask for it from Charlotte to Raleigh (where they’re a tenant of the state of NC). Conclusion: the states need to buy the tracks. Buy the tracks, and the freight haulers start being perfectly happy to put tracks next to each other like normal. Nathanael, the problem is that the value of exlcusive ROWs is too high for any state to afford acquisition. It is indeed even difficult to price the value of being a local monopolist in control of a freight railway where you don’t have other railways competing. It would also be political suicide in US, with calls of statism and socialism. It’s difficult to price the value of it, therefore the state can buy it for the assessed value. Well, actually, the problem is that federal law means that states can’t generally exercise eminent domain over railroads. The federal government can. Amtrak can. States can’t. And as for “calls of statism and socialism”, right-wing nuts yell that whenever anything sensible is proposed, even when people are proposing anarchist or capitalist options. You therefore have to ignore that to get anything done. Anyway, socialism is viewed positively by a majority of people under the age of 30, last I checked — perhaps because the only actual socialism they can remember is European democratic socialism, and practically everyone who’s seen that likes it — so this particular propaganda technique is going to be self-defeating pretty soon. I think too much focus is put on coal shipments out of hatred for the natural fact railroad companies (in US, at least) aim to maximize profits first and beforehand. (2) there is a growing operational trend of operating relatively long-ish sectors of rails as de-facto one-way routes with some other route as its counter-pair. That makes total sense for shipping containers from West Coast ports to the rest of the country, for instance, but it obviously kills any chance of passenger traffic. (4) for time-sensitive cargo, railroads face cut-throat competition from trucking and among themselves. The investments needed to make tracks fit for such traffic are just too high. On the other hand, because passenger trains face competition themselves with cars and airplanes, there is only so much track fees that could be charged to ensure more profitability than dozens of “2-miles-long” trains. Finally, an important note: many wide rail ROWs can’t fit passenger tracks, contrary to what some claim. Liability risks will prevent many railroads merely accepting the idea of having new tracks side-by-side with freight tracks unless physical barriers like concrete walls or very wide spacing is in place. Of course with today’s lack of emissions pricing, it’s more profitable for US railroads to focus on coal. The issue is that the same policy that would kill their captive market would also give them a competitive advantage against trucking in general, allowing them to steal higher-value goods and charge more. For example, make it more profitable for railroads to focus on higher-value traffic and they’ll learn to prevent derailments (Japanese passenger trains already share tracks with freight trains at several places, and there haven’t been fatalities from passenger-freight crashes in decades). Now, you’re right about points 1 and 2. These are an issue, though they’re not that insurmountable. It’s possible to increase clearances – in fact it’s been done at some places, such as the West Shore Line, to fit just one track for double-stacked freight. And the longer sections of turning two single-track routes into a de facto double-track route tend to be outside urban areas; what are bigger problems are the tendency of freight railroads toward bidirectional running even on double-track lines, and the fact that even hot intermodals are still less punctual than passenger trains have to be. Point 3 is less of an issue, unfortunately. Freight railroads already go through unprotected crossings at fairly high speed. US law is relatively lenient on grade crossing speed, though it’s not out of line with global practices. (The limit for grade crossings is de jure 125 mph and de facto 110, which compares with about 160 km/h and sometimes 200 in the European countries I’ve checked). In the UK I know of crossings on 125mph (200km/hr) lines, but they are grandfathered in. (“We’re not having a slower line just because of a level crossing!”). That said, they must be what the US call “quad-gates”. (Gates on both both lanes and both sides). The “two-gate” style (called “half-barriers” in the UK) can be only used if the lines speed is 100mph (160km/hr) or less. New lines aim not have *any* level crossings, regardless of line speed. In the US, 110mph to 125mph must be “impenetrable” level crossings, level crossings standard under 110mph are subject to more variation state to state. There is increasing likelihood of having to have quad gates and other upgraded safety features for 80mph-90mph and 90mph-110mph. Ah yes, quad-gates. Always a guarantee of safety here in the US. Only an idiot would consider them a guarantee of safety with the incompetent morons we have driving cars in this country, some of them driving while also texting, but given the incompetent morons we have driving cars in this country, quad sector gates are substantially safer than two sector gates. That’s why between 110mph and 125mph, the FRA requires gates that can stop of truck, with the gates that lock into a receiving post on the other side and are backed with steel cable being one contestant in the race to actually be approved for use in that role. Doesn’t matter what they’re locked into if the controller decides to raise the gates prematurely. So, you are saying that the FRA would approve a system as being impenetrable that allowed a controller to open the gates before the train has cleared the intersection? Hey, I never claimed they guarenteed safety. They are just safer than the two-gate option. Of course you didn’t: Matthew is just arguing a false dichotomy between “guaranteed safety” and “no safety improvement”. Have a heart! Have you never seen the damage that a freight engine can do to a straw man? The liability risk can be addressed trivially by having the state government purchase the tracks and lease them back to the freight haulers. It is notable that the outrageous demands for enormous track separation are only made on tracks which the freight haulers own, not on ones where they are tenants of the state. Where Should Streetcar Corridors Be?